With such an evocative title, Kiss the Blood Off My Hands stood out like a beacon on my list of not-yet-seen film noirs. With A-listers like Burt Lancaster and Joan Fontaine at the top of the bill, I assumed it was locked up for legal reasons and would never be available for viewing. Thanks to the magic of bootlegs I’ve now seen it. My DVD copy (quite good) is a recording from American Movie Classics, circa 1990. It must have aired during prime time, because the recording included Bob Dorian’s introduction, as well as fifteen minutes of network promos at the end of the picture, before launching into the first few moments of “The Flame and the Arrow” with Burt and Virginia Mayo. Those were the days when AMC reigned, and few cable providers offered TCM. 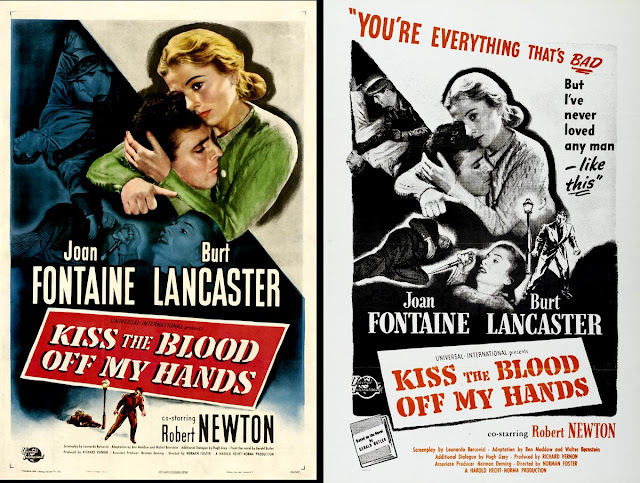 In Dorian’s introduction to Kiss the Blood Off My Hands he mentions that the film was made by Norma Productions, formed in 1948 by Burt and his agent, Harold Hecht, because the star was nervous about being typecast in the beefcake parts he was becoming known for. Norma’s first film was Kiss the Blood Off My Hands, for which Burt turned down the lead in a new Elia Kazan production that both the young director and Tennessee Williams thought he was the ideal actor for: A Streetcar Named Desire. With Lancaster not available, the part went to newcomer Marlon Brando. There are a million stories out there where an actor or actress famously turns down a landmark role (half of them seem to involve The Godfather), but this one resonates with me — what a picture Streetcar would have been with Burt in angst on his knees under that streetlamp. Misstep or not, things for Burt would turn out just fine. Norma productions made only five pictures, though that small number included important films such as Sweet Smell of Success, The Bachelor Party, and Birdman of Alcatraz. Kiss the Blood Off My Hands was a pleasant surprise, though I was initially skeptical as to whether or not it would live up to its salacious title. The film screams noir from the opening moments, as Burt, having accidentally killed a bartender, leads the Bobbies on a ten-minute foot chase through the maze-like London waterfront. He only escapes by climbing through an open window and forcibly shushing the woman he finds inside — a mousy blonde (Fontaine) startled from a restless sleep. The sequence plays without much dialog, and Russell Metty’s cinematography establishes the mood. Close-ups of a sweaty, terrified Lancaster abound. As do handhelds, chiaroscuro lighting, high angles, low angles, and seedy waterfront exteriors. The film’s noir motif is so strongly established that is compares favorably with Jules Dassin’s later London masterpiece Night and the City. 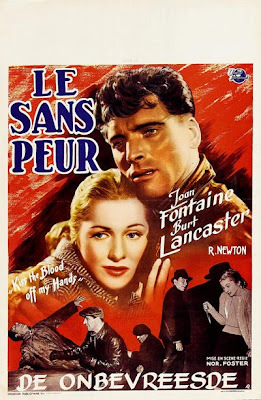 No actor of the classic noir period could project doomed angst like Burt Lancaster, and no actress wore empathy on her face like Joan Fontaine. It’s this damaged quality that draws her to him, and what keeps her around. She eventually pulls Saunders away from the abyss — metaphorically kissing the blood off his hands —and proves her love by waiting him out as he does a six-month stretch for punching a police officer. In the noir tradition, Foster employs setting to visually reinforce his players’ emotional states. In an important scene early in their relationship, Bill and Jane meet at the zoo, where the caged beasts remind Bill of his imprisoned past. Lancaster plays it well, at first joining in with the school children who “ape the apes,” before realizing how much he has in common with the creatures on the other side of the bars. Another interesting moment happens when Bill goes to prison. In addition to hard labor, the judge also demands a flogging — yes, a flogging! The scene is brings to mind the inquisition, or something from Billy Budd, as Lancaster, bound by hands, feet, and neck to a torture device, is whipped mercilessly, while a bureaucrat at a desk ticks off strokes. Another strong element is the presence of Robert Newton in a featured supporting role. Newton should be familiar to most film fans as either Bill Sykes in David Lean’s exquisite Oliver Twist, or as Long John Silver in Walt Disney’s Treasure Island. Here he plays a sleazy confidence man who witnesses Bill’s accidental killing at the beginning of the film, and holds it over him for the duration. His character at first appears to be nothing more than an amiable trickster — the kind of rascal who does nothing worse than claiming goods that have “fallen off the back of a lorry.” Yet when the stakes are at their highest at the end of the picture, he’s transformed into a grotesque, desperate ogre, and his welcomed fate foreshadows that of Anthony Dawson in Dial M for Murder. Kiss the Blood Off My Hands is a fine noir — beautifully photographed, well acted, and assembled with great skill. With everything it has going for it I hope it becomes available on DVD in the United States soon. I can’t imagine that most noir fans wouldn’t join the queue to purchase a disc, and maybe even a tin of biscuits. Starring: Burt Lancaster, Joan Fontaine, and Robert Newton. Fortuitous posting! Just yesterday someone came into the video store where I work and told me about this movie. I had never heard of it before - stellar title indeed! Thanks for the review. I have never seen KISS THE BLOOD OFF MY HANDS. Never had access to it! I actually remember it coming on WGN or WTBS back in the day (early to mid 80's, when they were the beacons of classic film, albeit with commercials)but never caught it. Ah the golden days of AMC! What memories, my how far they have fallen in my classic film mind. I still have many flicks on VHS that I taped from those "good old days" complete with Dorian and Clooney and MOST of them are from the very elusive Paramount. Thanks for the great post and allowing me to rant a little about what a shame that AMC has gone in the direction it has. I hope you're right about Turner acquiring the Paramount/Universal/MCA collection. Mark: Hah! Gotcha! I have seen this one! I got into a real Lancaster phase some time ago and secured a copy, I forget where. I agree with your post - very solid noir. Lancaster's career covered so many genre's (I love his 70s westerns) that it's sometimes easy forget his untouchable noir resume. Great post! just watched this great film on youtube. but can you tell me mark, although set in london, was this filmed in the usa or england? I'm not sure, but my guess is that this was shot entirely in the USA. If anyone knows different, chime in!